Casinoblaze will then reward you with a bonus (Welcome Bonus is for new players only). The terms and conditions of the bonuses vary between different casinos and might also change over time and between different countries, so it is important to compare the different offers and read the T&C for Casinoblaze before signing up. 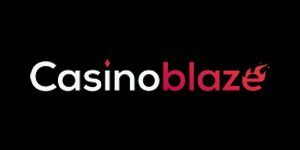 Casino Blaze is a 2018 addition to the portfolio managed by EveryMatrix, and while the brand itself is too young to have a reputation of its own, trustworthy parents and a Maltese operating license make us confident Blaze will perform just as efficiently as its siblings Jetbull, PlayFrank, Viks and others. The new Casino is certainly off to a good start with a huge assortment of games supplied by the likes of NetEnt, NYX, Quickspin and a dozen other large and small developers. Games are tested for fairness by either Technical Systems Testing (TST) or by eCOGRA so you can 100% sure they’ll always deliver random outcomes. It took more than a few providers to create a gaming library counting 800+ slots, table games and specialties. The list of contributors currently includes NetEnt, NYX, Quickspin, Lightning Box, 2by2 Gaming, Leander, Playson, Merkur, 1×2 Gaming, Saucify, Genii, Gamomat, Fantasma Games and PearFiction. Casino Blaze is an instant-play affair so no downloads are needed, and if you wish to familiarise yourself with a new game before risking any real cash, there’s Practice Play option attached to all except for live dealer games. Navigate to Blaze’s website with your mobile phone and you’ll find an equally user-friendly casino with more than 600 slots and table games accessible whenever and wherever. Experienced slots enthusiasts will be happy to see all-time favourites like Dead Or Alive, Guns ‘n Roses, Merlin’s Millions, Big Bad Wolf, Medusa II, Foxin’ Wins and Taco Brothers offered along rarely featured titles and recently launched games. Playson’s Joker Expand looks like a classic fruity but pays over 40 pay-lines and provides an expanding Wild Joker plus two Scatters willing to cash out substantial amounts. Super Duper Cherry from Gamomat is another classic-looking slots with a feature which makes cherries transform into a randomly chosen high-value symbol. Gustavo El Luchador is a lovely PearFiction video slot with interesting special features. Rumble in the Ring free spins play on a different reel area with 81 betways which pay both ways. Reels will spin for free until Gustavo is defeated or he manages to beat all four opponents, and as the result, you’ll win a multiplier of up to x4 applied to all free spin wins. Las Macaras bonus game prompts players to pick from an assortment of masks and dolls to win a bonus prize worth up to 250x their stake. Leander’s Zombie Rush Deluxe plays with 4 different Wilds, random re-spins, Nuclear Zombie feature which creates additional substitute icons in a fun manner, free spins with stacked zombie symbols, and multi-level pick-and-click Finding Claire bonus with generous cash prizes. Surprisingly large Table Games section offers further 80 alternatives, among which European, Double Zero, Astro, Chinese and Double Ball Roulette. Reely Roulette features a mechanism which would qualify it as a slot rather than a table game but uses round red and black numbered symbols and includes two interactive bonus rounds which mimic Roulette play. Blackjack fans get to pick between standard low and high limit games plus a range of Felt’s unique variants such as Lucky Lucky, 6 in 1, Buster, Lucky Ladies, Perfect Pairs, 21+3 and Suit’em Up. Collection of card games additionally includes Baccarat, Oasis, Texas Hold’em, Caribbean Stud and Three Card Poker, Red Dog Progressive, Casino Wars, Odd One In and Race The Ace. If your preferred gambling tool happens to be dice, launch Craps, Sic Bo, Six Shooter or Sharp Shooter. Poker fans have a further choice of close to 40 Video Poker games offering them to play 1, 10 or 50 hands simultaneously. They’ll find the familiar assortment consisting of Aces & Faces, Deuces Wilds, Jacks Or Better, Bonus Poker and the likes. Having found a mention of Evolution Gaming within the Casino’s help section, it’s disappointing to see the website doesn’t offer any live dealer games. Perhaps their Live Casino is work in progress and we’ll still get to see Evolution’s amazing range in not too distant future. The Casino accepts deposits of €10+ made via Visa, MasterCard, Maestro, Skrill, Neteller, Trustly, iDeal, Giropay, Sofort, ecoPayz, WebMoney, PaySafeCard or Bank Transfer. Players are able to withdraw a maximum of €500 per week and no more than €2,500 per month, unless they happen to be VIPs. Payout request are normally processed in no more than 12 hours. The operator has put together a very detailed FAQ list which tells players how to register and manage their account details, offers information related to deposits and withdrawals, answers bonus-related questions, describes security measures, and more. If, having read through it, you still don’t feel fully informed, get in touch with the Casino’s professional and friendly support staff. Live Chat delivers instant assistance and emails will receive a reply within 24 hours.